Looking for a bus in Oak Park? Chicago Charter Bus Company has access to hundreds of buses to take you to the Frank Lloyd Write historic home, the Earnest Hemingway Birthplace, and more. When you want to travel from the comforts of Oak Park into the city, wouldn’t it be nice not to have to drive? Especially for all kinds of big events in Chicago such as weddings, sports games, and all the entertainment downtown, sometimes it just makes sense to hire a driver. Chicago Charter Bus Company coordinates elevated group travel for Oak Park residents. When you rent an 18-passenger shuttle or a 25-passenger minibus with us, you can go anywhere—whether into Chicago or beyond! There is no trip too far for us and almost no group too big—the largest bus in the fleet holds up to 56 passengers, and we can always put together a fleet of buses just for you. For occasions requiring smaller vehicles, the minibuses we charter come in a few different sizes. Choose from shuttle bus sizes that accommodate 18, 20, or 25 passengers for a variety of events. These stylish and modern shuttles work wonderfully as wedding shuttles and bachelorette party transportation. This way, when you’re bar-hopping in Chicago, you won’t have to worry about who’s driving by the time you end the night at Three Dots and a Dash. 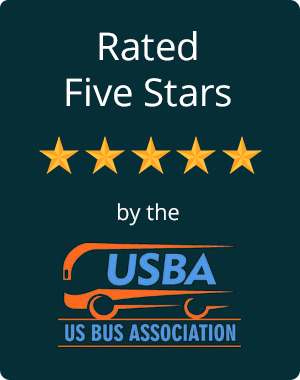 There are many reasons people rent minibuses and charter buses in the Oak Park/Chicago area. Take a look at our other bus service offerings if you’re curious if we rent out vehicles for your event or occasion. Or, better yet: Give us a call at 312-667-0906 and ask! We are happy to discuss your transportation needs to see if we can provide the perfect ride for your group. Need a ride to another Chicago neighborhood? We also service Naperville, Rosemont, Skokie, Elgin, and Glencoe, among others. Thinking about booking a luxury ride with us? Call 312-667-0906 today to speak with a booking specialist about Oak Park bus rentals. We are here 24/7 to give you a price quote so you can book within minutes.